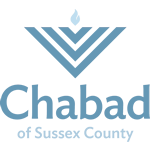 At Chabad of Sussex County the services are traditional, and are conducted in a joyous, casual atmosphere. Many of those who attend cannot read Hebrew, yet everyone feels at home. The prayer book is bi-lingual and various English readings are included in the service. Song and commentary add meaning and participation to the prayers. Children are included and most welcome. Please allow yourself the opportunity to visit and participate in our vibrant congregation. Please feel free to visit us for services or any other program, or just stop in to say hello.